The CXRCY flexible garden hose makes yard work feel effortless. It's incredibly lightweight and easy to maneuver so going from garden to patio or driveway doesn't involve a struggle. A valve right at your fingertips turns water on and off directly from the coil garden hose. This innovative garden hose contracts to a third of its size for easy storage. The garden hose also comes with an 10-pattern nozzle so you can choose the right pressure for every job. Just like magic, the CXRCY expandable garden hose expands to its 50-foot size when water is turned on. Then it "shrinks" to a third of its size when the water is turned off at the faucet. The CXRCY garden hose puts a shut-off valve at your fingertips. Strong double latex piping and 3/4" brass connectors give leak-resistant performance. Attach the 10-setting hose nozzle for watering potted plants, washing your car, spraying off muddy boots, and more. Never again will you have to lug around heavy rubber and vinyl garden hoses that kink and tangle. 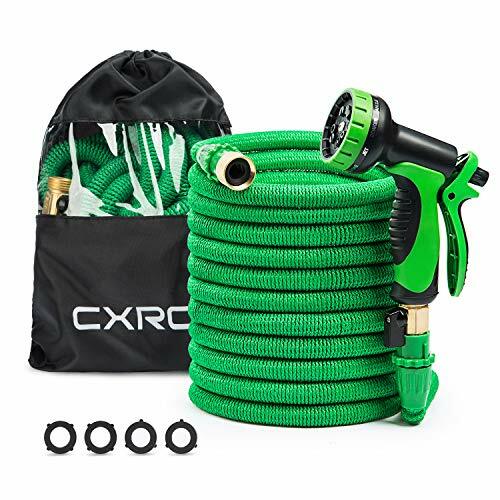 The CXRCY 50 ft garden hose is incredibly lightweight and ultra easy to maneuver and store. FREE 10 PATTERN HOSE NOZZLE - This expandable hose comes with a high quality spray nozzle with 10 adjustable patterns and ALL metal connectors, excellent corrosion resistance and durable quality!Perfect for many watering and cleaning uses: garden, workshop, lawn, car-washing shop, RV, pool, boat, etc. If you have any questions about this product by CXRCY, contact us by completing and submitting the form below. If you are looking for a specif part number, please include it with your message.